In this companion volume to Bird Coloration: Volume 1, Mechanisms and Measurements, Geoffrey E. Hill and Kevin J. McGraw have assembled some of the world's leading experts in the function and evolution of bird coloration to contribute to a long-overdue synthesis of a burgeoning field of inquiry. In Volume 2, the authors turn from the problem of how birds see and produce color and how researchers measure it, to what is the function of the colorful displays of birds and what are the factors that shape the evolution of color signals. The contributors to this volume begin by examining the function of coloration in a variety of contexts from mate choice, to social signaling, to individual recognition, synthesizing a vast amount of recent findings by researchers around the world. 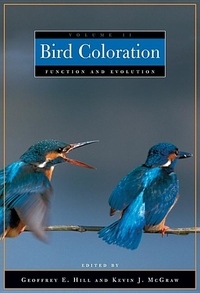 The volume and the series conclude with chapters that consider coloration from an explicitly evolutionary perspective, examining selective pressures that have led to the evolution of colors and patterns on body and plumage. These functional and evolutionary studies build from research on mechanisms of production and controls of expression, covered in the previous volume, bringing the study of color full circle. This sumptuously illustrated book will be essential reading for biologists studying animal coloration, but it will also be treasured by anyone curious about why birds are colorful and how they got that way.